2017. More than 2400 experts from over 20 countries turned up for the last STUVA Conference in Dortmund in 2015. Around 70 papers (with simultaneous German/English and English/German translation) will be presented over two days in Stuttgart. They will deal with tunnelling and tunnel operation. The separate block of lectures on the afternoon of Day 2 and the excursions on Day 3 will provide a greater insight into the Stuttgart–Ulm mega project. In December 2016 STUVA members were sent the call for papers, and currently the conference programme is being compiled in accordance with resolutions by the scientific advisory council and final approval by the STUVA board. 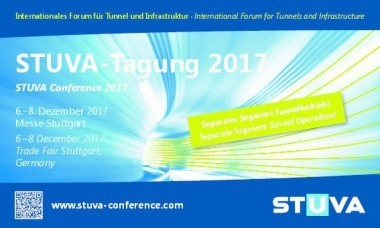 The programme is due to be published in early July 2017 on www.stuva-conference.com and can be requested there in printed form. You can register for the Conference as from mid-May. 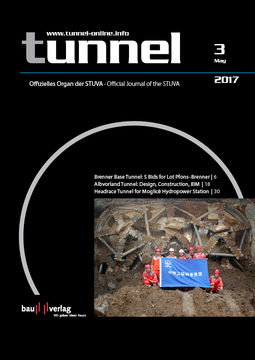 In addition to the “Tunnelling” series a separate, parallel series of lectures on “Tunnel Operation” was held in 2015 for the first time. This concept is being set forth in 2017 on account of the great resonance. 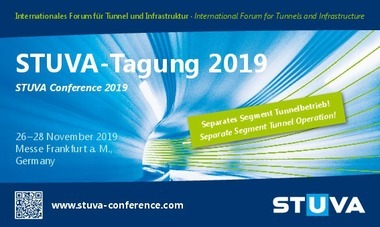 The outstanding importance of the STUVA Conference for tunnelling and tunnel operation has also been recognised by the German Federal Ministry for Transport and Digital Infrastructure (BMVI) and the Federal Highway Research Institute (BASt). In conjunction with the German Tunnelling Committee (DAUB) and the International Tunnelling and Underground Space Association (ITA), these institutions are official sponsors of the STUVA Conference.